1. Put a layer of primer, then cure with UV/LED Lamp. 2. Put a layer of Cat Eyes Gel (This step don't need to cure with UV/LED Lamp). then the pattern will come out, cure with UV/LED Lamp. 4. Put a layer of topcoat, cure with UV/LED Lamp. This is Cat Eyes Magic Magnetic Stick Board DIY 3D Nail Art, you can use it to creat the pattern which you want. Please click on the title or the picture to the product page. 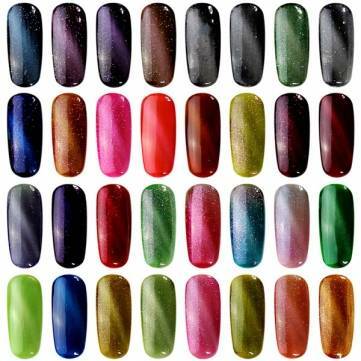 This is Cat Eyes Magic Nail Art Magnetic Pen, you can creat any pattern as you want.